During the First World War there was a huge increase in the number of women engaged in areas of work which had previously been dominated by men. One of these was clerical work within the Civil Service. 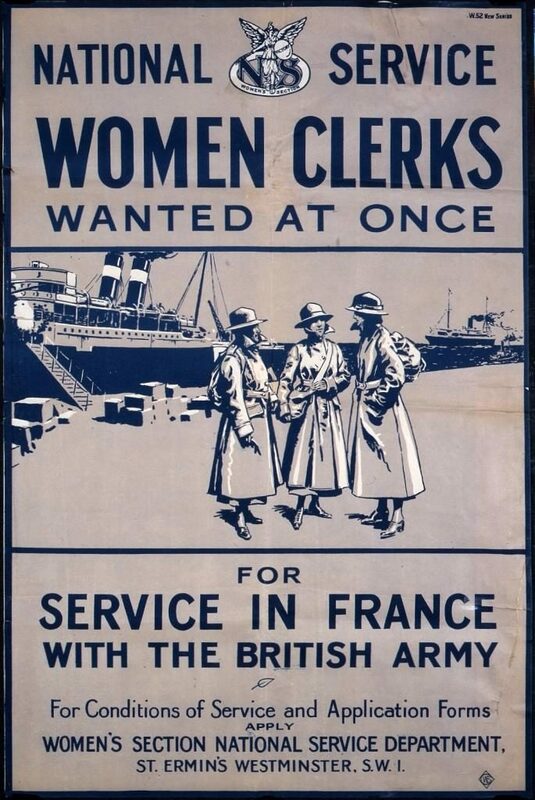 In fact, there were some women were working in the Civil Service before the outbreak of the First World War, but only in certain clearly defined areas and with very limited opportunities as regards pay and promotion. In this regard it is interesting to note that at the very beginning of the twentieth century, the Civil Service, which had been for thirty years the leading employer of women clerks, began to see a mass exodus of its best-qualified clerical workers and had problems with recruiting replacements. When in 1907 the Treasury commissioned a study of the problem, businesses were found to be offering both better wages and better opportunities to female staff than the public sector. A book published in 1913 entitled ‘How to enter the Civil Service’ includes a chapter on women as civil servants. The ‘grades of appointment’ available to women included women clerks, learners and sorters in the Post Office, women officers in labour exchanges, typists and telephonists. More senior and more highly-paid roles as Women Inspectors in the Board of Education and Lady Factory Inspectors are mentioned (‘Special’ roles), but the author warns that these posts are few and rarely available. It was only in 1915 that the major influx of women into the Civil Service began. A letter to Government Departments from the Board of Trade dated 22nd April 1915 in National Archives file CO 323/666/50 stated that, ‘a special register is being compiled by the Labour Exchanges of women who, in response to a public appeal issued by the President of the Board [of Trade], have signified their willingness to undertake service during the continuance of the War to release men for combatant duties.’ Over 30,000 women registered in the first few months, and one of the Board of Trade’s stated aims was ‘to supply a large number of Women Clerks qualified to take the places of Officers who may be released for service with the Colours.’ By April 1916 the number of direct replacements of men by women in the Civil Service was 73,000. By December 1918, the number of women and girls employed in the Civil Service and Post Office was estimated at 225,000, of whom eighty per cent were clerks in Government Offices. The arrival of the new temporary women clerks was not greeted with unalloyed joy by the existing staff. In the July 1915 edition of Red Tape, the publication of the Assistant Clerks’ Association, one correspondent suggested that it had not been demonstrated that ‘the supply of unemployed men clerks whose services could have been obtained for a reasonable wage, had been exhausted.’ The second, and possibly more serious concern expressed, was that there had been ‘a good deal of petty patronage in introducing temporary women clerks into the Civil Service.’ For Assistant Clerks, who had been obliged to undergo stringent examinations in a range of subjects to obtain their posts, this was anathema. It appeared to be a return to the system which existed before the reform of recruitment practices arising from the Northcote-Trevelyan Report (1854) and, as a result, it aroused a great deal of suspicion. 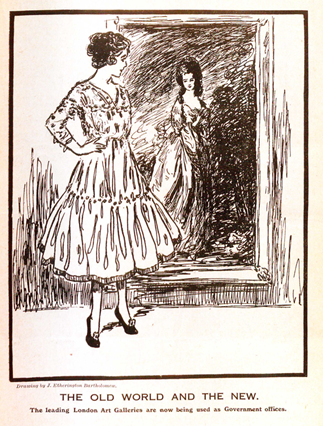 Illustration from Red Tape, publication of the Assistant Clerks’ Association, circa 1915.